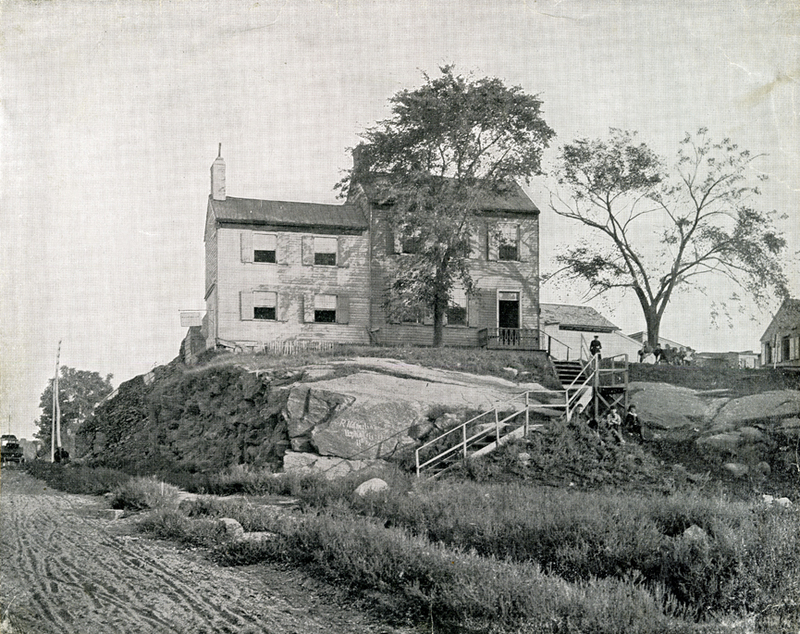 He named it Mount Tom, after young Thomas Brennan, the son of the farmhouse’s owner. 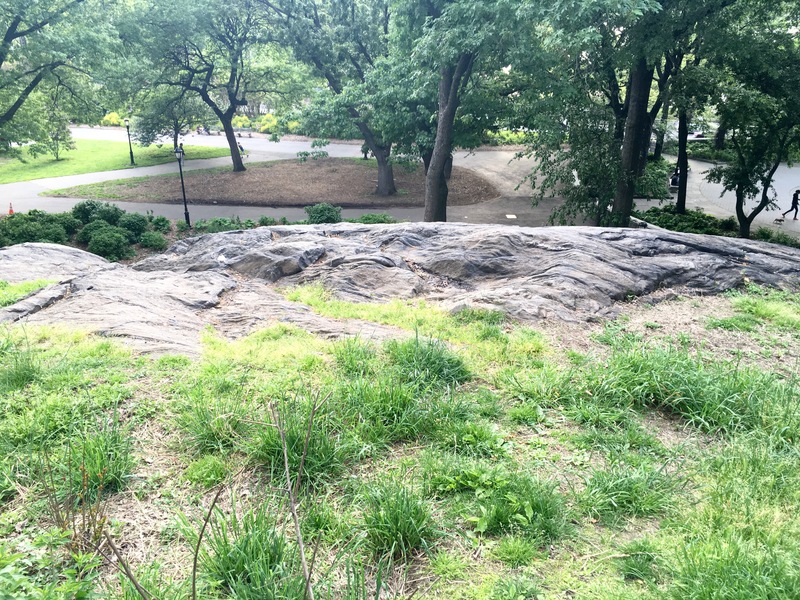 This outcropping still exists at the end of West 83rd Street (below). 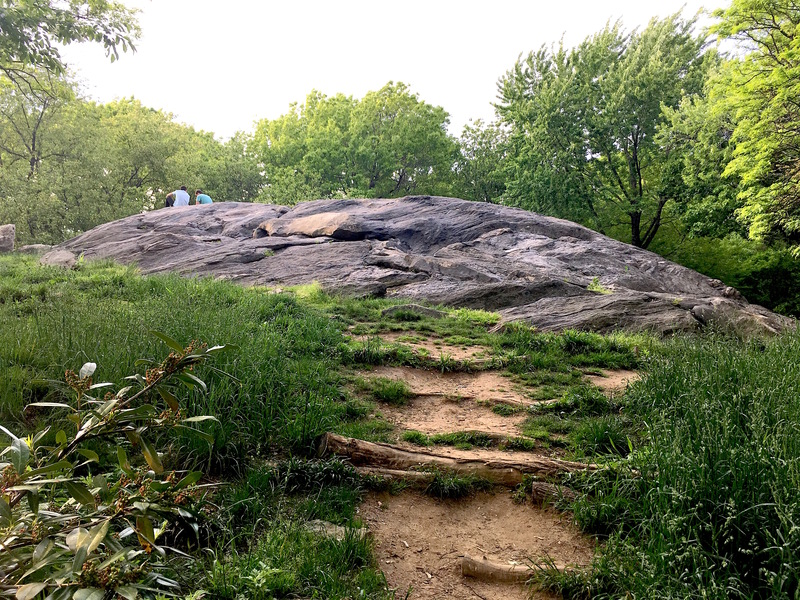 “It was Poe’s custom to wander away from the house in pleasant weather to ‘Mount Tom,’ an immense rock, which may still be seen in Riverside Park, where he would sit alone for hours, gazing at the Hudson,” states this 1903 Poe biography. “Poe and Virginia enjoyed sitting on [Mount Tom] and gazing across the then-rural riverland north of the city,” according to this collection of Poe’s work. In the same dispatch, he bemoaned Manhattan’s development and the end of its rural, spacious charm. “The spirit of Improvement has withered [old picturesque mansions] with its acrid breath,” he wrote. 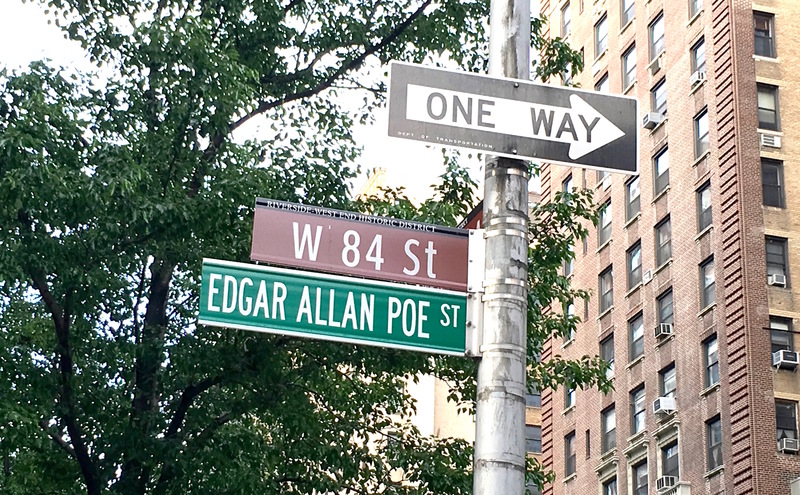 Poe didn’t last long on West 84th Street. After The Raven was published in 1845 and turned him into a literary sensation, he and Virginia moved to a cottage in the Fordham section of the Bronx. Tuberculosis took Virginia in 1847; Poe left the Bronx and found himself in Baltimore, where he died, perhaps from alcoholism, in 1849. I wonder what he would think of contemporary West 84th Street bearing his name? This entry was posted on May 23, 2016 at 7:56 am and is filed under Bronx and City Island, Poets and writers, Upper West Side/Morningside Hts. You can follow any responses to this entry through the RSS 2.0 feed. You can leave a response, or trackback from your own site. 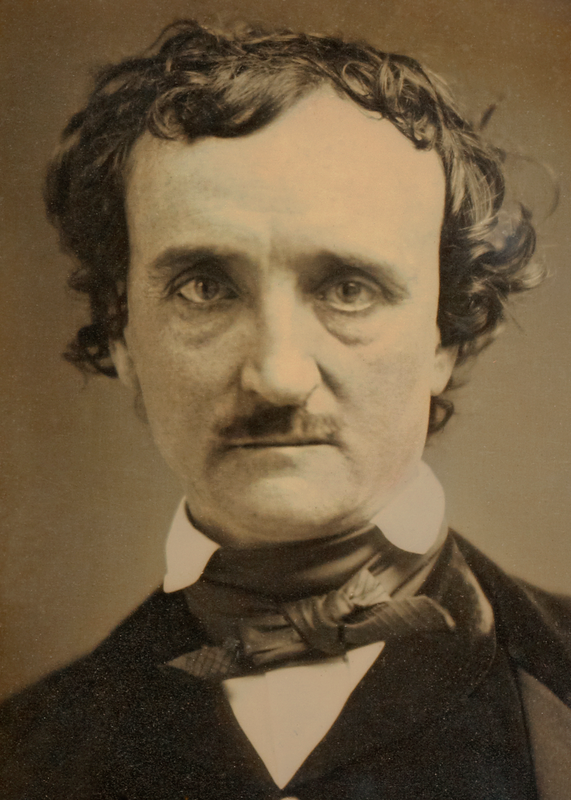 Very interesting history about Edgar Allen Poe! I love new york as it is now, but it’s nice to think about how if must have been then, too. It does sound lovely. Have always been fond of Poe for many reasons. Thanks for the lovely photos and history! I so enjoyed reading this information on the talented man. Knowing his fate, that photograph of Poe’s expressive face breaks your heart. The New York City homeplaces of Poe all seem spacious compared to the tiny, brick Baltimore dwelling he had at the end of his life. Always love “Ephemeral New York”‘s New York History. You’re welcome! It’s actually a pretty nice spot for relaxing on a late spring day; I can see why Poe enjoyed it. Great post! I always think about Philadelphia when I think of Poe. I did not realize he spent time in NY. These pictures are great – I love to imagine what things were like for writers from long ago.